Running a cleaning business involves managing field teams of all sizes. In order to effectively manage a cleaning workforce, you should be able to see who is working where, and are they being productive enough to yield proper results. In building a cleaning business, making sure that team members are working at acceptable levels of productivity is an important part of the process. According to CleanLink, the average cleaning company loses as much as 55% of its customer base annually. And the reason? Lack of service quality or non-performance. To combat this, cleaning companies can take steps to more easily manage their teams and clients. Here’s the latest insight on how to run your business even better. Whether you’re a second generation business or just started yesterday, these tips can help your business grow. Prioritize time management: Understand where you spend the most time and determine if that’s where your efforts should be focused. Many times, routine and time-consuming tasks can be automated with the right software. Streamline team management: Everything from scheduling to payroll can be much easier when you have the right tools. By doing so, you can focus more on growing your business and less on its day-to-day operations. Consider your marketing strategy: Will you be relying mostly on referrals? If you’re a newer business, you should consider your online presence and make it easy for potential customers to find you. Email marketing, social media and online ads can all lead to more customers. Customer service: Retaining loyal customers should be a constant goal as it’s much easier than finding new ones. By showing up on time, delivering on what was promised and creating a positive customer experience, you can improve retention over time. As an article from Square points out, you can also try a loyalty program that rewards repeat customers. In other words, monitoring team performance and better managing your time is vital in running a successful cleaning business. With the increased adoption of mobile workforce management solutions, cleaning businesses have better insight into their team’s performance. 1. Liz Trotter, American Maid Cleaning, LLC. Q. 1. A) How do you recommend owners manage their team? > Team management is widely debated from one company to the next, based on size, pay methods, etc. but for my money, I look to what will bring the largest return on the investment that we make into our team members every day. Whether this has to do with reducing windshield time, office time, supply management, or productivity metrics, the bottom line is going to come down to managing the time that is spent in each and every area of our businesses. Q. 1. B) What tools can they use to help keep track of their workforce as they travel to different job sites? > I am a big believer in utilizing resources outside the cleaning business whenever appropriate to maximize on the productivity of teams. Technology today has made it so easy and accurate to outsource time tracking that it doesn’t make sense to stick with the old methods of handwritten timesheets, with all their opportunity for error and deception. Likewise, time clocks are equally inefficient and outdated as a method of collecting accurate time reports. The additional legal security of using technology to track times accurately in our unique environment makes it a no-brainer in my book. Q. 2. A)What are the biggest mistakes owners make with managing their cleaning team? >Seeing and treating employees as problems rather than resources. Too many rules and restrictions that don’t allow the team to have an input into the jobs that they are penultimately responsible for out in the field. Q. 2. B) How can they overcome that? > I believe it is imperative for cleaning business owners (CBOs) to recognize that they will be able to see the results they are striving for by working with the people who are performing the services rather than at odds with them. Learning to manage teams from a position of mutual respect is the first step. Q. 1. How do you recommend owners manage their team? What tools can they use to help keep track of their workforce as they travel to different job sites? > Great question! Cost of Goods Sold (payroll for cleaning technicians) is far and away the biggest check owners of cleaning companies are going to write every month. Once owners of cleaning companies get above 3-4 teams, managing those teams and their schedules can be the difference between a profitable job and doing a bunch of work for nothing! I recommend to all of my private coaching clients that they automate and systematize as many aspects of their businesses as possible and time tracking and reporting is no exception. Q. 2. What are the biggest mistakes owners make with managing their cleaning team? How can they overcome that? > So glad you asked, allow me to officially step up onto my soapbox. The biggest mistake I see day in and day out with owners of cleaning companies, in regard to managing their teams, is the lack of systems and process. In the early stages of business, we can get by with generally knowing who is where, what they should be doing, and how long it should take. As our businesses grow, we require more systems to manage the added complexity of more jobs and more staff. So many owners of cleaning companies jump right to hiring a production manager, which is great, but can dig into profits pretty quickly. I think tracking software can be a great intermediate step before hiring a production manager to help track everyone as well as an integral tool once that person is in place. > For managing quality, we use Quality Driven software. We survey the client after each cleaning, the survey score and comments are recorded and attached to the client and also the employee who performed the job. At our company, our benefits are designed around achieving a minimum quality score to be awarded the bonus, paid day off, etc. The employee truly cares about their quality scores because they want to earn the perks that are tied to quality. The software allows us to easily see our employee ranking, any clients who are on the “client watchlist”, and gives us objective data should we have to let someone go due to poor quality. > At Dusting Divas we use Service Autopilot for scheduling software. We have gone to mobile clocking in & out and it allows us to see via Google maps where they are at, how long they’ve been at the home, etc. Q.2. What are the biggest mistakes owners make with managing their cleaning team? How can they overcome that? > My second comment regarding managing the team is make the expectations very clear with a policy and procedure manual. The important, most referred to policies should be very visible, perhaps posted on the office walls. Then, the critical piece is to be consistent. Sometimes it is hard to enforce the rules when doing so will leave you short-handed, but the rules are the rules, not just when it is convenient. > There is increasing pressure on wages with minimum wage laws and just market pressure from lower unemployment rates. Cleaning service owners need to drive down the amount of non-revenue-generating hours their employees are working. You need to be relentless in driving out cost by reducing the overhead in the office recording payments. You need to drive down drive time which does not generate revenue, and you need to find ways to eliminate expenses for things like the morning meetings. To be competitive you need to be on top of technology to enable to the cleaners to do more like accept their own payments. Clients need to be able to schedule their own appointments and to pay their own bills online because it is more convenient for them and it cuts costs. Those that do not stay on top of these technologies will find they are quickly falling behind. > Training and communication are always key. You need to always be sharpening the saw and making sure your people are delivering consistent service to your clients. You cannot train once and expect it to stick. You need to constantly reinforce your systems and processes. You also need to constantly keep the employees motivated and moving towards the goal. > Methods can be as basic as having the cleaning techs contact the office via phone/text when they arrive and depart a job location. 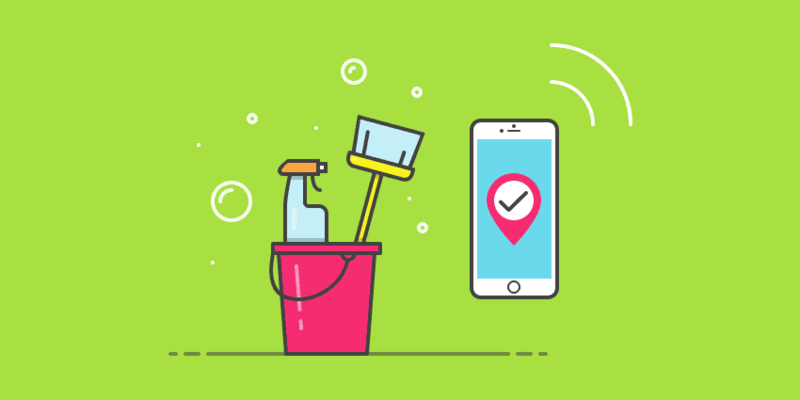 Some maid service scheduling software has a mobile workforce interface where technicians in the field can check in and out of jobs on a tablet or phone and their location is noted through GPS. Another tool owners can use to keep track of their workforce is fleet tracking technology which will obviously only work as an option if you have company owned vehicles. > I think the biggest mistake an owner can make is not taking steps to closely monitor and control cleaning technician labor costs. Owners can control labor costs through the methods discussed above. A strong training program can also help with ensuring productivity and efficiency with your technicians in the field. Owners must track labor cost on every home, every day or it can get away from you pretty quickly. Managing a successful cleaning business has its challenges, but a solution is out. Hubstaff helps you streamline daily tasks, simplify time tracking, pay staff and bill clients from one central app. You can cut out the most time-consuming tasks, which can also impact your business, and focus more on your clients. Try it free for 14 days and see the difference. What success have you seen so far? How do you manage teams, advertise your business, and deliver on client expectations? If you have deployed or come across any tools or processes for managing a cleaning business efficiently, please share them in the comments section below. This post was originally published April 2016, and updated January 2019.